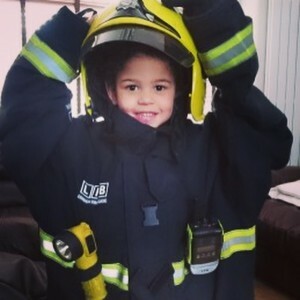 Tommy Simpson is a 4-year old boy of White (British) and Black (Caribbean) heritage who loves nothing more than playing with his toy aeroplanes and putting on his Dad’s uniform, pretending to be a firefighter. In January 2016 he was diagnosed with Acute Myeloid Leukaemia (AML), after being admitted to hospital a few days before Christmas. He has been in hospital ever since. Tommy’s parents London Firefighter Nigel Simpson, 48, and Education Associate at Mary Kay Cosmetics (UK) Ltd Maxine Francis, 45, have launched an urgent appeal to find Tommy a potential lifesaving stem cell donor; in the event his imminent test results reveal he will require an unrelated stem cell (bone marrow) donor to save his life. Tommy’s mixed heritage makes it extremely hard to find a donor as matching stem cell tissue types are inherited. Mixed race people like Tommy have less than a 20% chance of finding an unrelated best possible match; as do individuals who are black or from a minority ethnic background. There are only 3% of donors on the UK stem cell register who are mixed race, making Tommy’s chances of finding an unrelated donor extremely difficult. Ineligible ? Already registered ? Then encourage Just One More to do the same.